Cryptocurrency exchanges today are often thought and talked about merely as platforms to trade cryptoassets for profits' sake. However they will continue to be crucial for the ecosystem moving forward, serving as marketplaces on which we can exchange digital assets that can be utilized for various activities in our daily lives. As the token ecosystem matures, more use cases of the blockchain will come into fruition and we will start to see these cryptoassets for their utility beyond their price. For example, we may need to exchange the tokens we receive from storing someone else's files in our hard drives to pay for someone to lend their GPU power for our 3D renderings. Or pay electricity bills to the people who power our houses using their solar panels... Exchanges will be the lungs of our future with decentralised technology, and so it is important to address the vulnerabilities of current infrastructures for token exchange in order to ensure that a robust system is in place for the coming years. For my first post that dives into a specific use case of the blockchain, I'm excited to be writing about decentralised exchanges addressing these problems, and the projects currently being implemented. I will begin with a quick overview of centralised/decentralised exchanges and then dive into the 0x project - a decentralised exchange protocol that will serve as the public infrastructure for these dexs. Centralised exchanges are platforms and apps that enable us to buy, sell, and exchange cryptocurrencies against other cryptocurrencies or against fiat currencies (USD, EUR, JPY...). They are essential to the ecosystem today as they can act as fiat-cryptocurrency gateways for those looking to obtain and trade Bitcoin, Ethereum and other cryptocurrencies. Risk of fund loss and theft: you are giving the operators of centralised exchanges full control of your cryptocurrency as you're giving over custody of your digital assets when you enter into trades or leave funds on an exchange. The home page of Bittrex, a popular cryptocurrency-only exchange. Decentralized exchanges ('dex's): leverage the blockchain technology to enable safer and more transparent trading. They enable users to remain in control of their funds by performing their critical operations on the blockchain. Decentralised exchanges are ultimately peer-to-peer marketplaces operating directly on the blockchain. They solve the main drawbacks of centralised markets as there isn't a single point of failure, which aligns them with what has made blockchains so powerful in the first place . The custody of cryptoassets remains within each user's control. As a result, there is no honeypot for hackers in which funds are pooled. In late 2016, Amir Bandeali and Will Warren had been working on a tokenised derivatives project on the Ethereum blockchain when they realised that these tokenised derivatives would not be useful if there was nowhere to exchange them (this was before the days of Etherdelta) - they soon switched gears and begun building their own for-profit decentralised exchange. As the co-founders became more immersed in the Ethereum community, they found that a lot of project teams required exchange functionality for their tokens. Various teams had plans and proposals to build one-off implementations for their exchanges. It soon became clear that instead of a general dex which attempted to meet everybody's needs, what the community really needed was a truly free and public decentralised exchange infrastructure that anyone can plug into and use. And so, the 0x team shifted towards repurposing their system towards a public dex infrastructure. By having 0x serve as an open protocol on which anyone can create their own for-profit decentralised exchange, we open up a single piece of infrastructure to a wide variety of different use cases. This saves teams the time and effort needed to build their one-off dex implementations from scratch, as well as create a global liquidity pool that builds on network effects. When trading on an exchange that runs on the 0x protocol, users begin by broadcasting their intent to enter into a trade in a message format. This "message" is a chunk of data with parameters such as: tokens they'd like to exchange, buy/sell price, expiration time, and whether or not they'd like to trade with a specific counter-party (point-to-point order) or leave it open to anyone (broadcast order). Allows the trade settlement module to be upgraded over time without requiring users to migrate to the new version or disrupt ongoing trades. When using 0x in its simplest form (point-to-point trade), a user can package, sign the data and send it to a specified person via SMS, email, Facebook message, or whatever means they want. The order can only be filled by the specified taker address. The counter-party just has to then take that piece of data and inject it into the 0x smart contract, which will move the tokens between the sender and their counter-party at the exchange rate that was specified without the need for trust. However, people typically conduct large over-the-counter deals through an open exchange, where many buyers and sellers aggregate their liquidity, making it easy to find a counter-party that is offering the asset of interest at a specified price . The first dexs were using on-chain orderbooks, which meant that people were paying transaction fees to even initiate the order - this wasn't sustainable in the long term because you are losing value in the transaction process. Relayers aggregate these cryptographically signed 0x trade orders and present them to the world in the form of an orderbook, hosted off-chain. 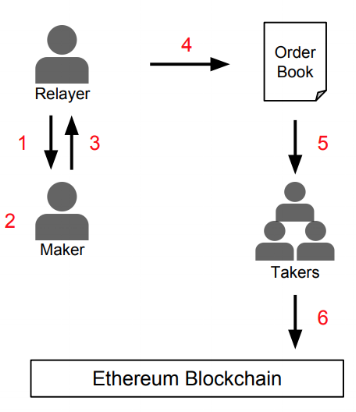 Off-chain orderbooks decrease trading costs but require a mechanism to match orders to their counter-parties, and this is where relayers come in. Since 0x orders are just chunks of cryptographically signed data, a relayer's job is to host a database of orders and sort them according to price, expiry time etc., and serve them to anyone that comes to the site looking for a counter-party. Once the parties have been matched, the trades are then settled on-chain. A relayer is therefore really a decentralized exchange that looks like a centralized one. However since they are not responsible for the custody of assets nor trade execution, they aren’t really acting as exchange but are instead relaying messages back and forth between people - hence the name 'relayers'. Generally, relayers are for-profit entities that build their decentralized exchange as a product running on the 0x protocol. User experience - if there are multiple teams competing for market share, one of the first challenges is providing great UX, everyone will benefit from the competitive approaches taken to achieve this. Transaction fees, which will move towards economic equilibrium. One of the big assumptions is that relayers will trade the same set of tokens. There is not a finite number of tokens people are interested in trading. This explosion of tokens that come into existence is going to continue and will trend towards infinity over the years . Relayers will find a market niche and carve it out, there will probably be a few dominant relayers in a specific niche but hundreds of niches e.g. relayers that focus on real estate tokens, on prediction markets (elections, politics, sports, science etc.) Each can tailor their product and the UX for specific markets. When you create, sign a transaction, and broadcast it to the P2P network, that transaction isn’t necessarily mined into a block straight away. The message has to propagate through the network and typically sits in a pending transaction pool (mempool) — waiting to be mined into a block. The transparent nature of the blockchain means that anyone can examine the unconfirmed transactions in the mempool. In the context of an exchange, this can be a drawback as other traders can use this public information to their own advantage. They can rebroadcast a similar or same transaction message but set a higher gas price so that their trade will get mined into a block before yours -- this is called front running. *Front running is an issue that isn’t specific to decentralised exchanges, it is just something that people associate with dexs a lot today because it is one of the use cases of smart contracts in production right now. There are various strategies relayers could use with varying degrees of trust. These models are not custodial, which is what matters the most. The 0x system is designed to be modular and extendable, there are models being explored that combines the of the openness of the open orderbook model with the strong trade execution fidelity of the matching model. Relayers are typically people who are running for-profit businesses. While cryptocurrency trading is still in a regulatory gray area, the pioneers are cognizant of this and employ good legal counsel to make sure they’re operating in a legally compliant way. What would prevent unregistered people from trading securities? 0x can be used to trade all sorts of ERC20 assets and there are currently no models in place to regulate private OTC trades. There are other projects exploring approaches to incorporate KYC (Know Your Customer) and AML (Anti Money Laundering) processes for the assessment of security tokens. Polymath and Harbor are examples of projects creating new token standards for trading securities tokens. These protocols implement proof of process by whitelisting Ethereum addresses of people who have gone through an off-chain KYC/AML procedure. Only people with those addresses are able to receive the token (that might be a security) and transfers to non-whitelisted addresses will fail. These protocols will be a layer underneath 0x that would prevent people from obtaining securities tokens if they hadn’t gone through the KYC/AML process. vulnerabilities when using a dex? Ideally, you’ll be using a hardware wallet to trade on a dex, with your private key is very far removed from anyone on the internet. Every single action has to go through your wallet in a way where you can examine exactly what's happening. The rationale behind using a token to pay fees (as opposed to just using Ethereum), is so that all stakeholders in the 0x ecosystem can participate in governance and voting. If only relayers hold tokens and vote, it will be unsustainable because their incentives do not necessarily align to the end users. It's important to distribute governance across the ecosystem as a whole. Voting is weighted on the amount of tokens you own. There needs to be a way to soft fork on-chain to keep everyone on the same shared protocol. If the team pushes out changes in a centralized way, where some people decide to stay on the old version, we'll end up with the same problem of fragmented, silo'd exchanges. There is a placeholder governance module that prevents the 0x team from doing malicious activities. This will eventually be replaced with a decentralised governance system that uses the ZRX token as the primary lever over which these protocol upgrades are approved/denied. While the trading functionality is already in place, the 0x team is taking their time to build out a robust governance model as the long term success of the ecosystem depends on it. Are all stakeholders equally qualified to analyze an upgrade and drive the governance process? Real world governance is a very challenging problem. Right now, the 0x team are collaborating with Aragon team for research into liquid democracy: the way that stakeholders in the ecosystem to delegate their voting power to someone that they deem capable to vote on their behalf. This will allow the people with expertise to voice their opinions and have sufficient voting power even without the monetary resources at their disposal. When it comes to dexs, one of the things I'm looking forward to the most is the emergence of these niche marketplaces for token exchange. The exchanges widely used today differ mainly in aesthetics and market prices, but there isn't really a clear boundary for what types of tokens Bittrex and Poloniex and Liqui offer, for example, and what specific communities they serve. In an answer to why there probably won't just be one dominant dex where you can trade everything, the 0x founders made an interesting anecdote to Reddit and its subreddits. Subreddits are communities within Reddit where people can talk about whatever subject it is they are interested in. The UX of each subreddit is customized to that community to some extent, yet you still can't fully tailor the experience for it to be unique from the other subreddits. You still need a platform that is fully customized for your needs. For example, vinyl collectors have a vibrant community on /r/vinyl but they still need Discogs to find and obtain records. In the future, there will be exchanges that specialize in energy tokens, non-fungible tokens, prediction market tokens (and even within this there will be those tailored to sports, politics, gaming etc.)... and these exchanges will customize their UX to best serve that specific use case. Therefore while there will be few dominant relayers in each niche, there will be many niches for token exchange - it's exciting to see what these marketplaces will look like.